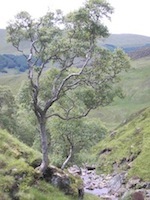 (2) Birch trees on Scottish mountains. Dwarf Birch is rare and found mainly above the tree line, whereas Downy Birch is widespread below the tree line. The two species hybridise a great deal. We are using new DNA sequencing methods to work out how the two species maintain their identity in the face of hybridization, and the extent to which hybridization impedes the conservation of dwarf birch. We are especially interested in how global warming affects the dynamics of this system. This work is funded by a Fellowship from the Natural Environment Research Council. We have recently sequenced the whole genome of Betula nana (see paper here). The birch genome website can be found at www.birchgenome.org. 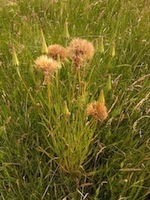 (3) Hybridisation of Tragopogon species (Daisy family) in south-east England. We are studying diploid hybridisation between Tragopogon pratensis and T. porrifolius, which results in T. x mirabilis. We have found abundant hybrids in natural mixed populations in London and have preliminary evidence that they are reproducing. This work was funded by a pump-priming SYNTAX grant in collaboration with Andrew and Ilia Leitch. Summer 2013 Planet Earth The last stand? Students on our MSc Ecological and Evolutionary Genomics or MSc Ecology and Evolutionary Biology programme can apply to do their research project in this lab. Prospective PhD students are encouraged to apply to next year’s intake of the London NERC DTP. Students from outside Europe should explore our studentships list. Prospective postdoctoral research associates from outside the UK are encouraged to consider applying to the Marie Skłodowska-Curie Fellowship Programme. If you are interested in any of these opportunities, please contact Richard Buggs directly.